Sat, 1 Aug 2009 | Published in I Was There . . . Apparently, you’re an idiot if you’re a fan of Black Moth Super Rainbow. Or at least that’s what the video displayed right before Black Moth took the stage at South Street Seaport would have you believe. The tongue-in-cheek, YouTube-like video of a disgruntled guy with a home video camera barraging insults towards a crowd of eager fans for their lack of music taste epitomizes the modus operandi of the band – clever, irreverent humor and the ability to just not care about anything but the music. Oddly reminiscent of the man behind the curtain, the most action on stage came from a guy in a gorilla suit and mask lip-synching to the songs while the real singer and mysterious mastermind behind Black Moth, a.k.a. TOBACCO sat on the floor with his synth and vocoder out of sight of the crowd. Even so, in the case of Black Moth Super Rainbow, the amazing psychedelic beats and other-worldly synthscapes of the songs provide no desire to pull back the curtain because the music speaks for itself. Black Moth started off the show with the first track of their new album, “Eating Us,” produced by legendary record producer Dave Fridmann, who is known for his work with The Flaming Lips, Clap Your Hands Say Yeah, and MGMT. While the production is definitely a bit slicker on their new album, Dave Fridmann didn’t mess too much with a good thing, and Black Moth’s live performance retained a raw quality by seamlessly blending the new tracks with the rougher, lo-fi tracks of previous albums such as Dandelion Gum. While the songs are composed mainly by one person in Black Moth, the remaining members of the band held their own with the bass player laying down hard grooves, the drummer masterfully duplicating the sometimes complicated, produced beats on the album, and the other members carefully adding layers of catchy riffs and melodies on synth keyboards. 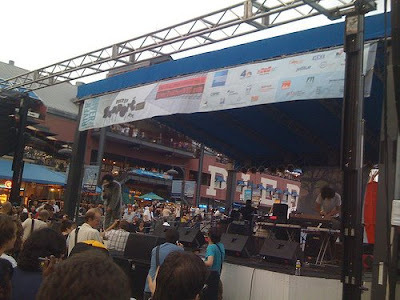 The South Street Seaport venue next to the water definitely added to the ethereal sounds of Black Moth, and it seemed as if even the boats in the background were swaying to the beat. Another highlight of the night was the amazing freak-out session on effects pedals and keyboard by the one and only Dan Friel from the band Parts and Labor.